So, it seems I touched on a nerve, or something twitchy, when I posted here last month about the scary hinterland that is the post A License Land of the Lost. A lot of you have thoughts about this but are too wussy to post an actual comment, so instead I’ve had the following conversation with like ten different jumpers I know IRL. Cut to the next day, a cloudless sky and an open load. Okay. I may have exaggerated the overall response but seriously…two trips to the DZ now have garnered me very little enthusiasm for jumping with the new kid (me). Although, I did horn in on a six way belly and managed to hold my slot and not feel like the greenest of greenhorns. Which was fun. I don’t say this to make anyone feel bad/guilty. 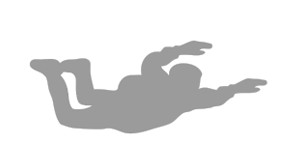 It is no one’s job to jump with me or mentor me or somehow make this skydiving thing easy. Let’s face it: it’s not easy. 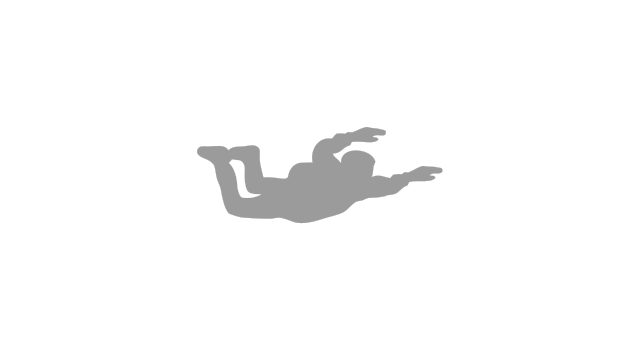 Learning to freefall is not easy. Paying for jumps is not easy. Saving for a rig is nigh to impossible. Saving for tunnel time: are you kidding? Learning how to get on groups and find mentors – even for someone extremely sociable like me – it’s tough. I go out with a group of skydivers most Wednesday night for pizza and beers. They say I am pretty connected but I know I am still a rookie all the time when I spend time with this crew. I don’t know half of what people are talking about as they throw around initials and names of groups which always seem to start with the word Dirty. It’s like saying I drive a silver minivan, right? Sigh. So pathetic. For some reason I cannot just memorize all these names and brands of canopies. They are just names. They all sound the same. And then four other people, two of which who have less jumps than me, start going on and on about the ring systems and closures on each kind of container and how everybody knows that the Outback Skysword has notoriously hard openings, but a superior glide ratio so it’s totally worth it. And I stand there, illiterate and pitiful. Wishing a ninja would come sweep me off my feet and teach me how to skydive. Cuz it would be awesome to be a ninja skydiver. If I was a ninja, then nobody would even know if I screwed up. And I’d look like that. Totally. 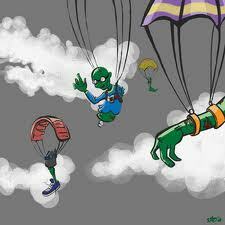 Or, it would also be cool to be a zombie skydiver because I wouldn’t need to buy an AAD. You know, cuz zombies are already dead. I might need more sleep. Okay. That’s enough whining for this week. Who wants to help me choose a canopy? Or a Halloween costume? Anyway, What little advice I can offer is this: Do your research, I have found that “Skygods” and other more experienced jumpers tend to be more accepting when you know what you are talking about, IE: I just bought a new rig, before I did, I read up on everything from the container to the AAD. One – it puts you in a good position to know what you’re buying, and two (Mainly) – it shows the “Pro’s” that you are interested in learning every aspect of the sport, rather than just jumping out of a plane. I have found that the actual jumping out part, is quite a small part of being a “Skydiver”, skydiving is a lifestyle, in fact – a way of life! And like our everyday life, the more you put in, the more you get out. Blue skies and happy days!! I hear ya. Good advice for all. I do spend quite a lot of time (for me at least: juggling three kids, job, etc) learning about the sport. There is SO much to learn. The SIM alone is mind boggling at times. Some of the post is hyperbole for the creative license of humor. That’s what i do. Make fun of myself and give extreme examples. I’m really not the complete moron I represent myself to be in this blog all the time. Jumping IS way more than jumping. We do need to learn everything we can about the sport, first, to be responsible and safe and keep the sport clean. Also, because it will help us to establish cred with those who know so much more than us. I couldn’t agree more. I just can only learn so much so fast. And its fun to make fun of myself.